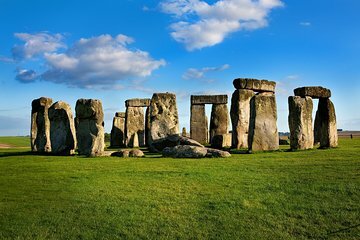 Designed to delight travelers interested in ancient history, this private 8-hour tour covers the UNESCO World Heritage Site of Stonehenge and the lesser-known sites of Woodhenge and Avebury Stone Circle. Departing London in a vehicle equipped with Wi-Fi, you’ll spend a couple of hours at each site, learning about the mysteries and legends surrounding each. Hotel pickup and drop-off are included, however entrance to Stonehenge is not. Explore always-popular Stonehenge before ducking off the tourist trail to visit two less crowded Neolithic sites. This was a great trip and our driver Neil threw in a bunch of extra detours! I originally booked the trip for 6 people and two dropped out it was a good thing because cramming 6 people into that car would've been miserable. When you have 6 people vehicle needs to be a mini-van!!!! We had a fantastic experience. Our guide was deeply knowledgable about the history of each of the sites and was clear to separate what we known vs. what was theorized about the history and usage of these sites. While Stonehenge gets all of the glamor, missing Avebury circle or woodhenge would be mistakes. Why? Because woodhenge provides context for stonehenge, the two are a pair and Avebury circle isn't overwhelmed with tourists so you can come up close to the stones and get a deeper appreciation for the capabilities of the societies that built these temples. Great personal tour of these ancient ruins. The guide was very accommodating with great suggestions to make the tour most efficient to get the most out of our time. Very knowledgeable about the history and surrounding areas.